Citronella is widely used as a non-toxic insect repellent. It also has antifungal properties and research suggests it is calming to dogs who bark too much. It is often added to canine shampoo. The oil comes from mana grass, originally found in Sri Lanka but varieties of it are also grown in Indonesia. It has been cultivated widely in many warm parts of the world, especially where there are mosquitoes. There are chemical differences in the varieties, the Sri Lankan being preferred for mosquito repellent candles and sprays for use on skin and apparel as well as diffusing for insect and odor control indoors and outdoors. The Javanese variety is higher citronellal and geraniol and is generally preferred by the perfumery industry. Citronella oil has been found effective mainly against the Aedes aegypti mosquito, the one responsible for Chikungunya, dengue fever, and yellow fever. Though originally from Africa, the mosquito is found practically everywhere in the world. Chikungunya is epidemic at this time. It is a very serious disease, characterized usually by an acute stage in which there is high fever and then a chronic stage in which there is lethargy and joint pain that lasts for months or years. One human carrier can infect thousands of others. Dengue fever is a hemorrhagic fever that is also serious and pervasive. The WHO says 2.5 million people are at risk and there are 50 million cases annually. It starts usually with a splitting headache and rash, petechiae, and goes into the muscles and joints. The virus is related to the Hepatitis C virus and has been implicated in liver cancers. Once contracted, herbs may help reduce complications and inflammation. In Brazil, cat's claw is the herb of choice. Yellow fever gets its name from the jaundice that appears on the second or third day after symptoms manifest. Though usually milder than Chikungunya and dengue fever, the virus replicates and spreads via the lymphatic system and thence to vital organs. It is viral and potentially fatal since it may cause necrosis, hemorrhaging through the skin, or toxic shock. We actually do not need to go on and on. What we need to realize is that, according to a report I heard on cable television years ago, malaria — just one disease transmitted by mosquitoes — has been responsible for the deaths of two-thirds of all people who ever lived on this Planet. In short, underestimating the potential severity of a mosquito bite is not just unwise, it is foolish. Preventing bites through taking adequate precautionary measures is, however, wise. Common sense dictates having mosquito netting or screens while using some sort of repellent when outside in mosquito-infested areas. Unfortunately, in today's world, this includes urban as well as rural areas, tropical and temperate climatic zones, and humid as well as dry places. Citronella oil comes from a grass that is not particularly relished so cattle starve when attempts are made to introduce cattle to the grass. The leaves are a bit waxy but release the aroma when broken. In short, growing the grass does not really prevent mosquitoes from lurking. It is necessary to distill the leaves to capture the oil. Then, the oil can be used in luau torches or candles. It can also be misted or diffused, placed in roll on or spray bottles and applied to the skin or clothing, or added to body lotions or hair conditions to give a bit of extra power to the products. If there are mosquitoes in the air, it is often necessary to reapply the oil every 20-30 minutes because, being volatile, it dissipates quickly. Uncaria tomentosa is a rain forest herb with demonstrated antiinflammatory properties. It is therefore often used for people with rheumatoid arthritis. 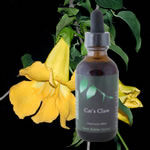 Preliminary studies suggest that cat's claw slows tumor growth and that it enhances immunity. It is safe in the recommended doses; side effects are usually associated with possible allergic reactions to plants in the Rubiaceae family. "Oil of Citronella is considered so unlikely to cause harmful effects that some citronella products are exempt from the usual regulation." "Repels various specific insects including mosquitoes, black flies, fleas, and ticks."